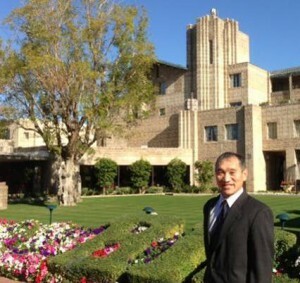 The guest speaker at an ITE Southern California Section, Eric Shen of the Port of Long Beach, made a presentation on the value of goods movement. Among his key points: We shouldn’t be installing bike lanes on every truck route. That got me thinking about “Complete Streets Chicago”, the design guideline recently announced by Chicago DOT. It includes a diagram that ranks four modes in a hierarchy. The urban planners in my office made sure I saw the diagram. Ranked first are pedestrians followed by, in rapidly shrinking order, transit, bicycles, and finally the lowly auto. 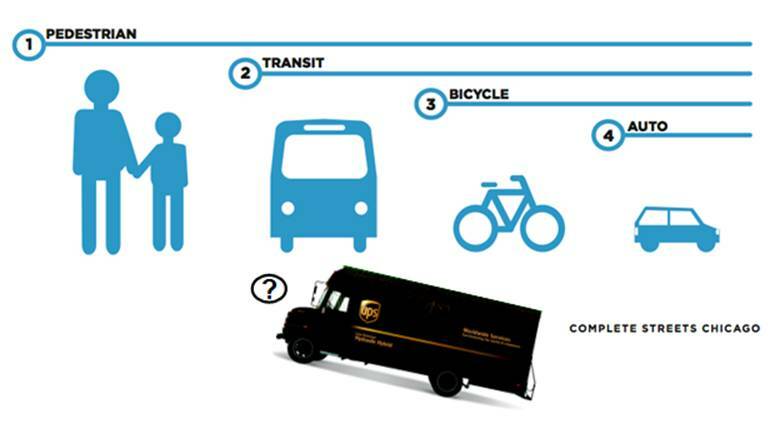 Where does goods movement fit in Chicago’s Complete Streets Hierarchy? The order? I get it. Everybody is a pedestrian at some time, even if it’s only when walking to the garage. Transit is a more efficient and greener way to move people than cars. Bicycling, while efficient and green, ranks third because not everyone can ride a bike. Automobiles are pushed to the margins in last place, which wouldn’t be far-fetched if the world runs out of oil. But if people can’t drive to Walmart to replenish their supplies, the goods will have to come to them. I believe goods movement should be wedged into the hierarchy at least as high as Number Two, if not higher. If deliveries come to your door, and work comes through the Internet, you wouldn’t even have to be a pedestrian. To me it’s clear: goods movement is too important to be screened out with inadequate turning radii, limited truck routes, and removal of loading zones. This is the kind of epiphany that can happen when attending an ITE meeting. Now I’ve got to get back to my bike lane design.